So, nobody told me about Vulfpeck. Apparently they've been just about the coolest thing around for, like, 5 years now and I just found out about them a month ago. I'm gonna try to make up for lost time with this transcription of the single from their latest record The Beautiful Game. 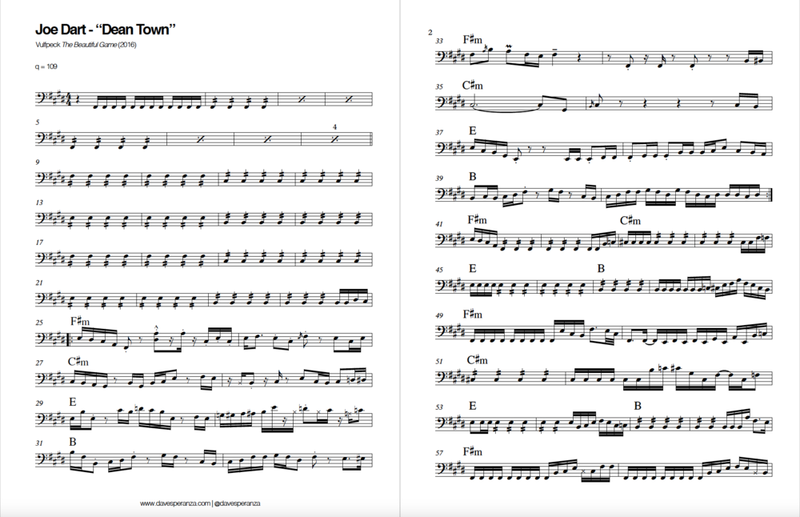 "Dean Town" is a tribute to Jaco Pastorius' "Teen Town," featuring a wildly syncopated bass melody over a crazy funky disco drum groove. I tried to make it as easy to read as possible, but syncopated 16th's just never seem to be easy. Staccato 8th's should be played the same as the 16th's, they are just notated that way to avoid obscuring the beat with too many 16th-note rests. Let me know if there are any other notation things that could be changed here to make things more clear. The first time through the melody, Dart plays some things ever so slightly different than he does the 2nd and 3rd times through. I chose to ignore those minor variations here. As always though, any comments, correction, or feedback are welcome. Jack Stratton just released the multitracks including the isolated bass track from this session. I made a couple updates to the transcription. I made a remix backing track with the bass (and drums) stripped for you to play along with. Unfortunately there was a lot of bass bleeding in the drum tracks, but I added Jack's overdubbed handclaps for the backbeat.